The Hy Clarino Half Chaps are made from a soft and stretchy faux suede which allows for a close and comfortable fit, and accommodates a wide range of shapes and sizes. Zip fastening with secure press stud at the bottom and a reinforced elastic foot strap. 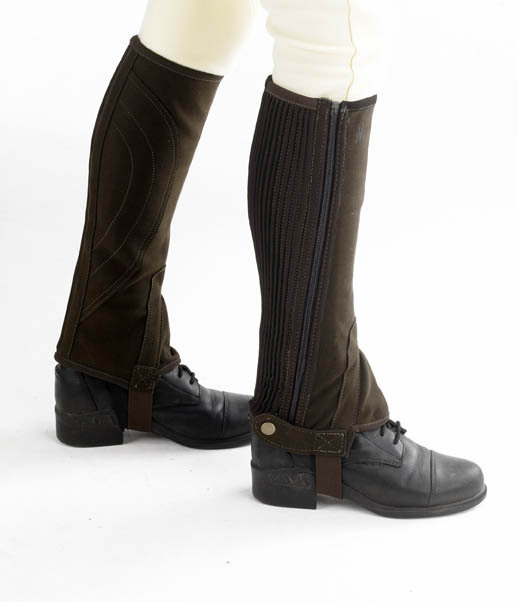 Reinforced calf pads on the chaps help protect the rider's legs, and prevent excessive wear. Warm and water resistant. Machine washable, these Hy Clarino Half Chaps are ideal for all types of riders and everyday use. There are currently no questions for Hy Clarino Half Chaps Adult & Children - be the first to ask one!